The RTK-251-1PowerBank3 and RTK-251-BuckBoostConverter2 are USB-IF PD3.0 certified design kits and are claimed to simplify and speed the development of USB Power Delivery (PD3.0) and USB-C battery charging applications such as USB-C computing hubs, power banks, car chargers, SSD enclosures, point of sale printers and desktop displays. The RTK-251-1PowerBank3 board is a three-cell (series connected) Li-ion battery power bank reference design that uses the R9A02G011 USB PD3.0 controller and ISL95538B buck-boost narrow voltage direct charging (NVDC) battery charger. The battery charger has up to four-cells, with a default setting of three. Suitable for USB-C multi-battery-cell power banks, the reference design board includes a USB Type-C port that supports the dual role power (DRP) feature; it delivers power in both directions via power source and power sink modes. When the power bank is in sink mode, it requests 5.0, 9.0, 15, or 20V from a USB PD3.0 provider such as an AC adapter. When the power bank is in source mode, the Li-ion battery supplies 5.0 to 20V requested from a PC, tablet, or smartphone. The board changes its DRP role based on the remaining battery capacity displayed on the board’s LEDs. The RTK-251-BuckBoostConverter2 is a DC/DC module using the R9A02G011 USB PD3.0 controller and the ISL95338 bi-directional buck-boost voltage regulator. 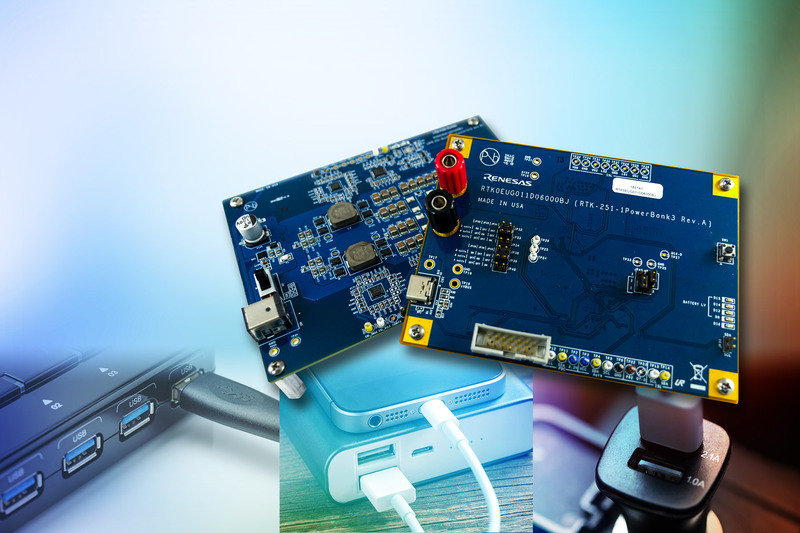 The reference design board targets USB-C hubs as part of the USB-PD AC adapter connection. It accepts 19V with 4.73A DC input power and produces USB-PD3.0-compatible VBUS output power. The reference design board supports programmable power supply (PPS) and has two USB Type-C receptacles for VBUS power output. Software development kit sample code and parameter settings are configured through the company’s USB Power Delivery Controller Flash ROM Image Generator software tool. Both reference design kits are available now.